7PM WEDNESDAY, APRIL 2 Fearless Females Talk with Dr. James Helfers: "Margery Kempe" ﻿Dr. James Helfers, professor of English at Grand Canyon University, presents "Margery Kempe: Earthly Wife and the Pilgrim Bride of Christ." It's the next talk in the popular Fearless Females series from the Arizona Center for Medieval & Renaissance Studies. 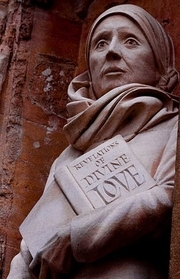 Margery Kempe is a unique figure in both the history of female Christian spirituality and in the history of literature. Though illiterate, she is somehow the author of what some critics call "the first autobiography in English." Tonight, Dr. Helfers, using Kempe's own words, explores the life and travels of this fearless medieval woman. Kempe is honoured in the Church of England on 9 November and in the Episcopal Church in the United States of America together with Richard Rolle and Walter Hilton on 28 September. Margery Kempe is currently considered a "single author." If one or more works are by a distinct, homonymous authors, go ahead and split the author. Margery Kempe is composed of 9 names. You can examine and separate out names.